It’s not cheating to use those little candy shapes you can buy on a card at the grocery store. They’re fun! 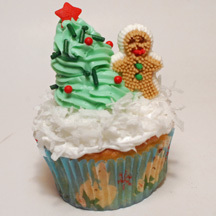 But you can jazz them up a bit by creating a little scene on your cupcake. What You Need: 1 cupcake; white frosting; green frosting (I used Pillsbury’s holiday icing in a can); coconut; pastry bag and 1M metal tip or large star tip; Christmas sprinkles; large star sprinkle, premade gingerbread boy. How to Make It: Frost cupcake while and sprinkle with coconut for snow. Assemble tip and bag with green frosting and make medium green swirl for tree. Add sprinkles and star for decorations. Stick gingerbread man next to tree. This entry was posted on Tuesday, December 16th, 2008 at 5:44 pm	and is filed under Christmas cupcakes. You can follow any responses to this entry through the RSS 2.0 feed. Responses are currently closed, but you can trackback from your own site.